‘Snowflakes and Cinnamon Swirls at the Winter Wonderland’ is the latest book by Heidi Swain. After calling off her engagement, Hayley, the Wynthorpe Hall housekeeper, wants nothing more than to return to her no-strings fun-loving self, avoiding any chance of future heartbreak. Little does she know, Wynbridge’s latest arrival is about to throw her plan entirely off course. Moving into Wynthorpe Hall to escape the town’s gossip, Hayley finds herself immersed in the eccentric Connelly family’s festive activities as they plan to host their first ever Winter Wonderland. But Hayley isn’t the only new resident at the hall. Gabe, a friend of the Connelly’s son Jamie, has also taken up residence, moving into Gatekeeper’s Cottage, and he quickly makes an impression on Wynbridge’s reformed good-girl. As preparations commence for the biggest event of the season, the pair find themselves drawn ever closer to one another, but unbeknownst to Hayley, Gabe, too, has a reason for turning his back on love, one that seems intent on keeping them apart. I spent the last few days reading this book and it really got me into the festive season. The story is seen through through the perspective of Hayley, who’s looking forward to getting married and spending the rest of her life with Gavin until she finds out that he’s been cheating on her. She starts a new life in her workplace called Wyhthorpe Hall, where she has friends there looking out for her. Whilst she starts over, a newcomer arrives in the village. A handsome man called Gabe, quiet and brooding, Hayley finds herself drawn to him and his mysterious, gentle nature. As the story progresses, we see Hayley grow in confidence and become a stronger woman as her friend rally around her and encourage her to continue with her dreams. Together the team of friends, go about creating the most magical Christmas for the village. A heartwarming story from the very beginning, this book was a joy to read. The characters were charming and relatable with their situations in life. I loved Hayley and thought she was a lovely character who grew in strength with each chapter. Sweetly written with warmth and love throughout, ‘Snowflakes And Cinnamon Swirls At The Winter Wonderland’ is a tender and fun Christmas story that is perfect to curl up with. 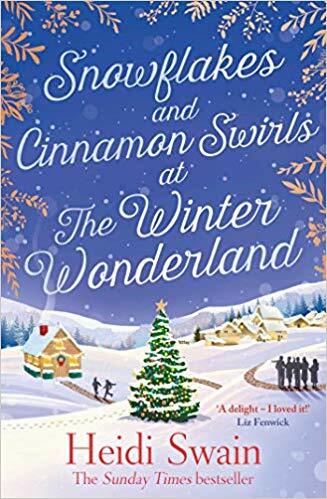 You can buy Snowflakes and Cinnamon Swirls at the Winter Wonderland from Amazon and is availble to buy from good bookshops.